It’s that time of year when we turn to lighter, fresher foods to satisfy our hunger. Often, though, it seems like those foods just aren’t as satisfying. I usually find myself turning to some variation of avocado toast with veggies to fill me up. And while I love it, I think I’ve found something to one up my favorite toast. 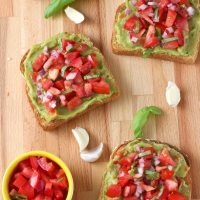 Bruschetta guacamole toast! 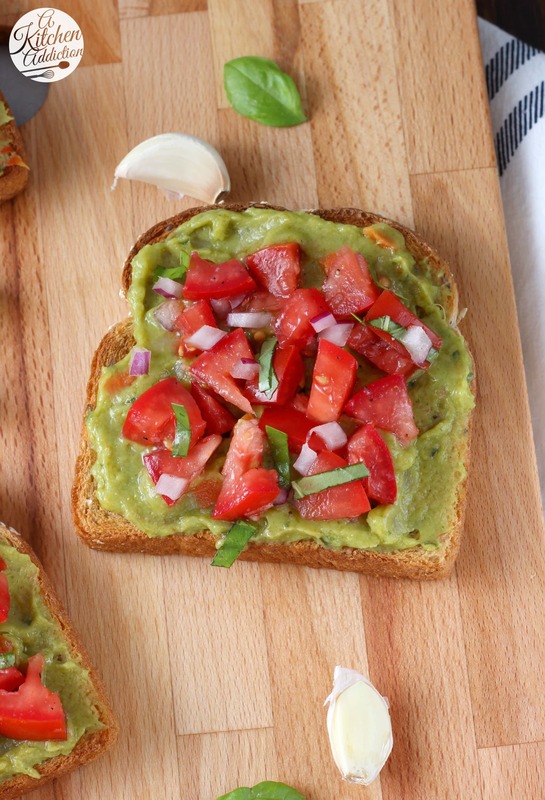 Fresh tomatoes, fresh basil, garlic, onion, and, of course, guacamole make up this fresh, summery toast. Perfect for putting your abundance of summer produce to good use! They are all gluten-free, vegan, and kosher, and their guacamole has 30% less fat than a regular guacamole. Each flavor contains seven varieties of real, crisp vegetables. An easy way to get a boost of veggies in your diet! 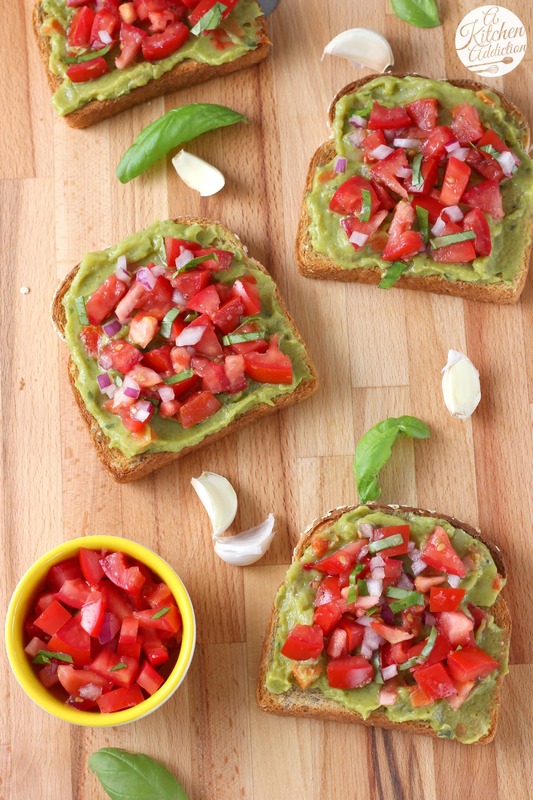 Just spread on the guacamole, combine the bruschetta mixture, layer it on top, and serve. Quick, easy, healthy, and flavorful! And to top it all off, it’s filling! 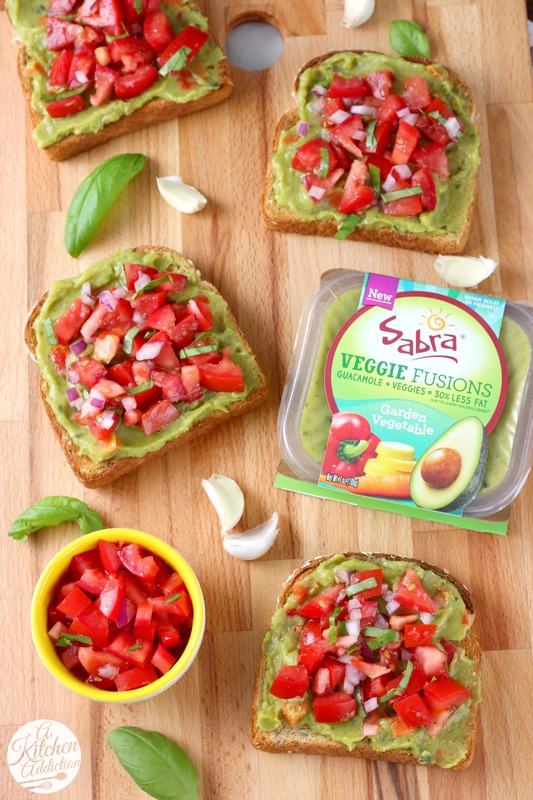 Be sure to head to Sabra’s website, and grab a coupon to save on your next package of guacamole! You’ll find it in the refrigerated section of your deli! Divide container of guacamole evenly among slices of toast. Spread evenly over the top of each slice. In a small bowl, stir together tomatoes, red onion, basil, garlic and olive oil. Season with salt and pepper to taste. Divide evenly on top of the slices of toast. Serve. 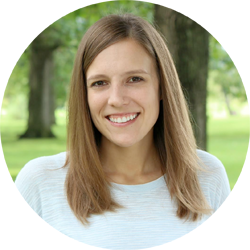 Disclosure: This post is sponsored by Sabra as part of their Sabra Tastemakers program. All opinions are my own. Thanks for supporting brands that make A Kitchen Addiction possible! I agree avocado (or guac in this case) is so satisfying. I am totally inspired by this combo! Yum! Love this breakfast, snack or lunch. So simple but so delicious and filling. Now this is my kind of toast! 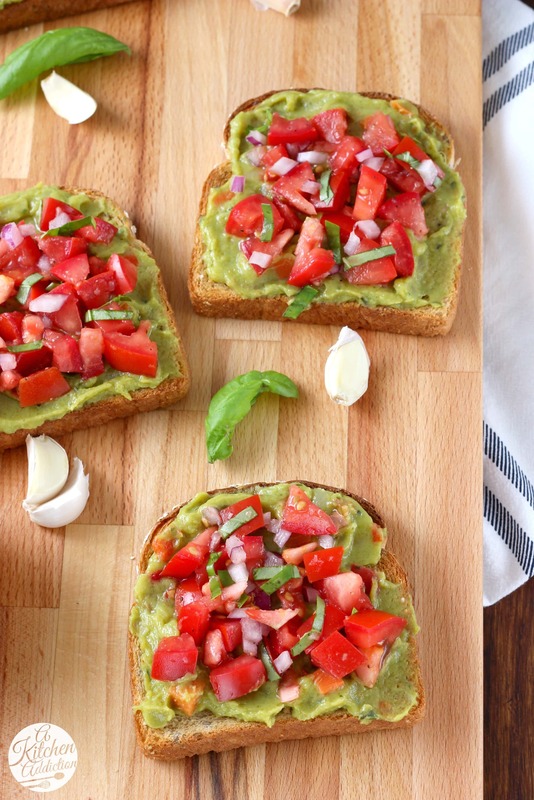 Bruschetta and guacamole are two of my favorites, so this looks perfect! This looks fabulousJessica. And now I’ve got to try Sabra’s Mango Lime! Sounds heavenly. This toast looks delicious!I seriously need to try this sometime. What a fabulous avo toast. 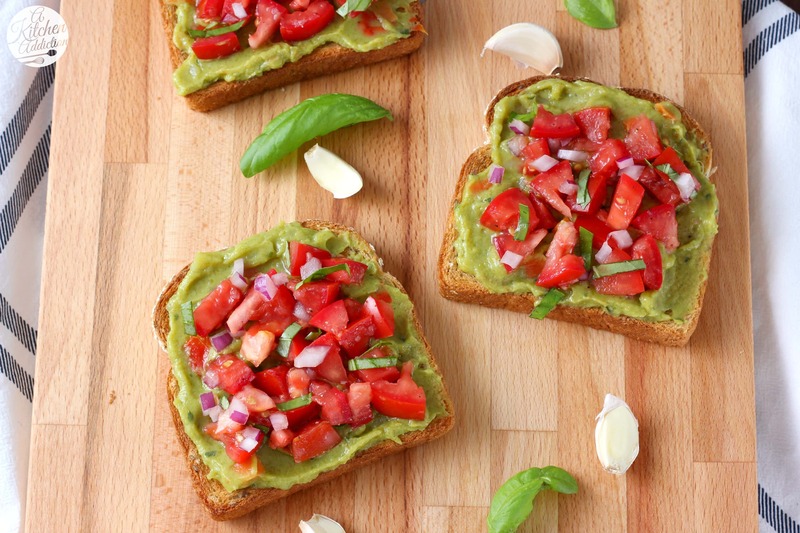 Brushetta and avocado are such a winning combo! I so agree – sometimes lighter foods don’t fill me up enough but avocado toast always does! This bruschetta version sounds fantastic! Love this flavor combo! So simple and delicious! We are loving lighter meals these days too! With it so hot outside, we are usually more thirsty than anything and just a simple meal can satisfy! 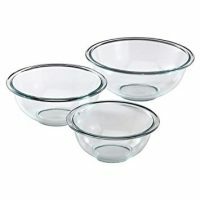 These are so perfect for those busy summer days!